The Pope and Obama seems to agree on must issues. Arte they the new dream team? It signals the start of a five-day tour across D.C., New York and Philadelphia for the 78-year-old Roman Catholic leader, coinciding with the United Nations summit which will see more than 100 world leaders arrive in New York. In a rare move, the president was on the tarmac with his wife Michelle, their daughters Malia and Sasha, and Michelle’s mother Marian Robinson to meet the pontiff at Joint Base Andrews at 4pm (Eastern Time). 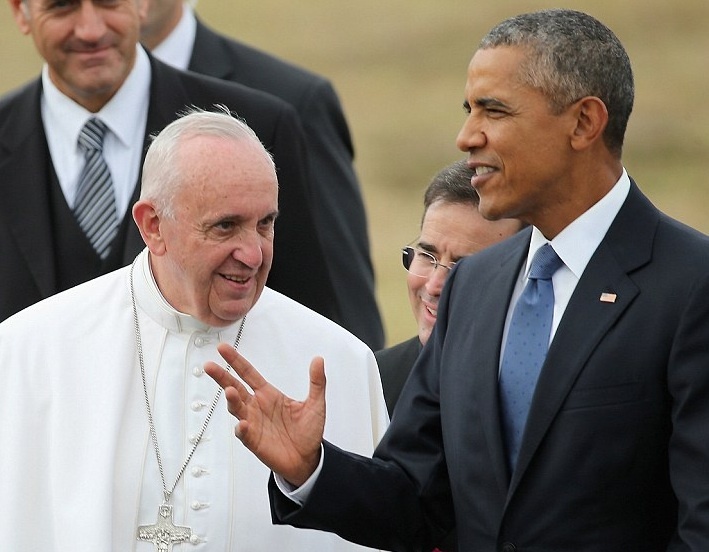 The Pope and Obama agrees on most global policy issues. Many look up on them as a dream team, and hope they can bring peace to Earth. 1. The nuclear deal with Iran will bring peace to the Middle East. 3. Israel must withdraw to 1949 cease fire lines. 4. Turbo capitalism is bad. We need to care for the poor. 5. The USA and Europe must receive the migrants from Syria. 6. Through a new environment regime we shall save the Earth. 7. We must not condemn gays who honestly are seeking God. 8. It is quite normal to have an abortion, and forgiveness for this sin must be granted. The problem is that the name of Jesus is delated from their agenda. They talk a lot about “god”, and agree that there are mnay “holy books” and different paths to salvation. In this way, these two leaders are building the end time region. They desire to be loved by all. They will jointly set up a new one world Government, which will be hailed by the multitudes. Who the last man of lawlessness will be, is still an open question. But among Bible reading evangelical Christians you will not get a good return if you be on the Pope. He has been branded as an antichrist by reformed Christians for most of the last 500 years. Only in this generation, one of the fruits of the the great apostasy is the acceptance of the Pope as a Christians leader. Jesus the Messiah gave us a stern warning. Jesus answered: ‘Watch out that no one deceives you. For many will come in my name, claiming, “I am the Messiah,” and will deceive many. Also Paul the Apostles told us to be careful, so we do not follow a false Jesus. Not only by what they say, but by their fruits, we shall recognize the true believers. I don’t need to hear more clear words, the antichrist will make a covenant with the PLO , the bible says that is antichrist. that is the POPE who claims to be the HOLY FATHER, a name only G-d HIMSELF is..HE is a false god and is satan..He preaches another gospel and the spirt of hell itself..not to mention the so called globel warming is going to cause the poor to die of hunger. Gen 1 tells us the seasons will never change..G-d is the only truth..I have to say to myself , how can anyone not see thru this gay pople lke most of the others, who tells the world Chirst will die at the end of the age, homosexuals are a gift from G-d. He blasphemed the whole world of G-d, now our true G-d warns from such turn away and expose them as anyone who believes the lie, and refuses the truth, that G-d will send a huge lie and they will believe it too..the road to hell is wide and only a few are on the narrow road and some fell off the narrow road and became twice the sons of hell. keep praying.. The Pope is an imposter! Jesus says, “Whether is easier, to say, thy sins be forgiven thee; or to say, rise up and walk? But that ye may know that the SON OF MAN (Jesus) hath power upon earth to forgiven sins, (he said unto the sick of the palsy,) I say unto thee, arise, and take up they couch, and go into thine house.” Luke 5:23&24 Jesus is God! The pope is a liar, a deceiver, and a false prophet who makes himself a god who claims he can forgive sin and change God’s word. Revelation 22:18&19 do not add or take away from God’s word. God made it clear in His word that homosexuality and fornication is an abomination! Sodom and Gomorrah is a fact. So is Romans chapter 1. Leviticus chapter 18. Thanks for this comment. The Pope can only be undertood to be a deciever, by comparing Roman Catholic theology with the Scriptures. One of the main errors by Evangelicals today, is to ignore the Bible, and set central Christians doctrines aside. They call for unity with the papacy outside of Biblical truth.